The year is racing towards the finish line with such speed I really don't know which way is up most days. I am counting sleeps with the kids because I really need some downtime to regroup and get all my ducks in a row again. I'm constantly looking for my notebook to add more things to the holiday list or the Christmas pressie shopping list. I'm going totally OCD with my lists and driving the rest of the family crazy. We fetched report cards this morning and said thank you and goodbye to the teachers. 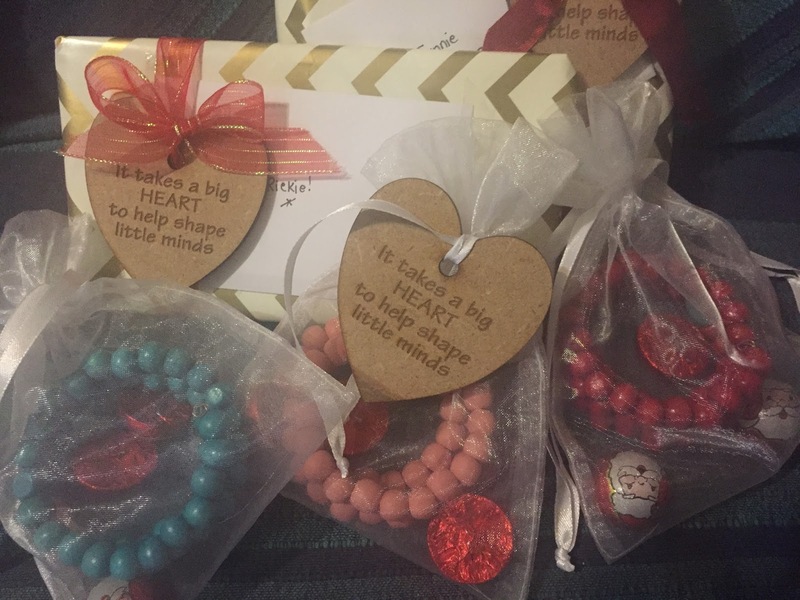 We did some fun bracelets for teacher gifts this year. I think they are pretty awesome. Sometime different to the usual chocolates and hand creams. I usually reflect back on the year a little bit later in December but I was chatting to Mr W's teacher this morning and she reminded me how far he has come this year. He started the year off as a shy, reserved boy and grew into a little chap with self confidence. He really came into his own this year. He made a really good friend and I can see that this is going to be a long friendship. I have never seen 2 little boys just totally "get" each other like these two. They have even developed their own special way to communicate! With a few nods and shakes of the head, they are totally on the same page whilst the rest of us are still wondering what on earth is being discussed! Once in a while the kids have a teacher who just means the world to them (and to their mom) - Mr W had one of those this year. These teachers are so much more than just mere teachers - they make a profound change to your child's life and I will forever be grateful for this teacher for doing that for Mr W.
Ms M rocked this year like she always does. She thrived in so many areas and got an amazing opportunity to represent SA at the Commonwealth Chess games in India. How many 8 year olds go to India to play chess? She worked hard this year and it makes me so proud. She started out the year with clear goals and she did everything she set out to do and more. We hit a bit of a rocky patch in the middle of the year with girls bullying her and making her life miserable but even that she faced head on and I can see she is not even giving it a second thought anymore. Her rapport card reads like a bit slot machine according to Mr K... 7 - 7 - 7! She has a great teacher next year and a very good friend who will be in the same class. I am so glad for her because she deserves a bit of happy to end this year with! Onto other news.. I found this on my desk this morning with the new Joel Osteen book. I am overjoyed about the book as I was planning on buying it for myself anyway but even more I didn't know that all the nonsense I talk on a daily basis made such an impact on this lady's life. She is a single mum with a son the same age as Mr W so Mrs Bossy Boots is always offering advice and an opinion on various mommy things. Her fiance was killed in a car accident last year, right before she started working here and her mom the beginning of this year. 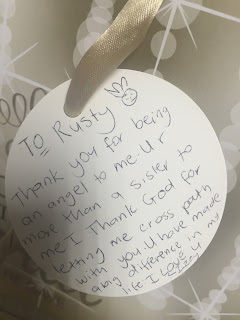 I burst into tears when I read her card... how SWEET! Just shows that a little friendliness (or is that bossiness??) can make a huge difference to someone's life. How cute is the drawing? She calls me the Queen. I think its SO funny cause I can be a bit of a drama queen at work! :) I am so humbled by her kindness and generosity. This surprise gift has definitely made my week! They both did so well and I love your teachers gifts. And wow about the book!